An independent label, also known as an indie label, is a record label that is independently funded and not connected to one of the big three major labels — Universal, Sony and Warner. Indie labels range from home-based hobby labels to highly profitable, large businesses. In the 1990s, the line between indie labels and major labels began to blur somewhat, and now some large indie labels are actually distributed by the big three major labels. 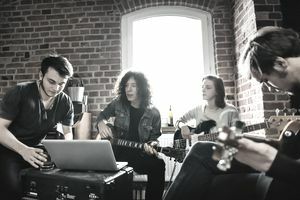 Indie labels often face an uphill battle trying to get their music heard, as they typically have far fewer financial resources to promote their music than the major labels do. Despite the struggle, many independents have survived and thrived for years. Many others may not have lasted forever but had a tremendous impact on music both creatively and in terms of business. Independent record labels have been around for much longer than most people think. In fact, some of the first indie labels were started in the post-war era. Traditionally, many of these labels worked with artists who were not considered mainstream. For example, independents like Sun Records, which was founded in 1950 in Memphis, signed country and rock artists. Some of these artists include Elvis Presley, Roy Orbison, and Johnny Cash. A lot of independents still operate that way — signing on talent that may be on the fringe. Britain was a hotspot for the independent scene, leading to the creation of several popular labels like Triumph and Chrysalis Records. Several successful artists British launched their own independent labels in the 60s and 70s — notably, The Beatles launched Apple Records and Elton John, who created The Rocket Record Company. The latter didn't fare so well and closed in 2007. As time went on and more people grew to understand the music and record industry, newer labels were coming to the limelight. In the 80s and 90s, rap artists were gaining notoriety after being signed by independent labels like Def Jam and Bad Boy. Madonna — whose first label was Sire Records (once an independent itself) — helped other new artists on her own independent label, Maverick Records. Independent record labels are not necessarily profitable on their own. But according to Digital Music News, independents now outshine the major three record labels when it comes to revenue. The magazine reported independents collectively had more than 32% of the market share in revenue for both physical and digital music sales — more than each of the big three in 2017. Universal brought in 29.7%, while Sony and Warner raked in 21.9% and 16.2% respectively. Independents as a group also accounted for the most physical music sales when compared to each of the big three. There is no way to pinpoint how many independent record labels there are in existence. This is due to the rise in popularity of digital music, which allows people to create their own labels easily. According to Profitable Venture, a small, standard independent record label can be started easily with very little money — anywhere between $20,000 and $50,000. Indie labels have more freedom to pick and choose which artists they sign. If they decide to sign with you, it's because they like your music and your taste. They are less likely to insist on changes to your sound or image than major companies. That means you will have more creative control with an indie label than with one of the Big Three. There is also a bigger likelihood you will own the rights to your own music. That means you can do what you like with the song once it's recorded, whether you sell it for a commercial or for use in a movie or television show. The other, obvious benefit is the close relationship you'll have with those who sign you on. You will get to know the indie label staff very well. With fewer artists to work with and a more intimate staff, you are more likely to connect with someone and get a quick response. Most indie labels also sign smaller, shorter contracts, so if it doesn't work out, you're not stuck with the same company for very long. One of the biggest drawbacks to signing with an indie label is money. While there are some very profitable labels, most independent ventures are very tight on funds. Not only can they not afford large payouts, bonuses or large recording contracts, they also cannot afford large marketing campaigns or promotional tours to help build awareness of your work. This can make it more difficult to build a name for yourself and sell your records. Additionally, because indie labels are so small and often short-staffed, they can be disorganized and even confusing. Many of their agreements are done with just a handshake rather than a formal contract, so details can be missed and issues can arise due to misunderstandings. Finally, the smaller size of indie labels can limit your future opportunities. Because of their smaller budgets and smaller string of artists, independent labels typically don't have strong relationships with the press, making coverage of your events hard to come by. Signing with an independent label has its upsides and downsides. Before you sign an agreement with any label, make sure you understand what you are agreeing to and what your options are. Who you sign with has huge implications for the future of your career.